The Smok G80 80W TC Starter Kit is an advanced sub ohm starter kit for liquids that designed to provide amazing flavors over massive clouds. 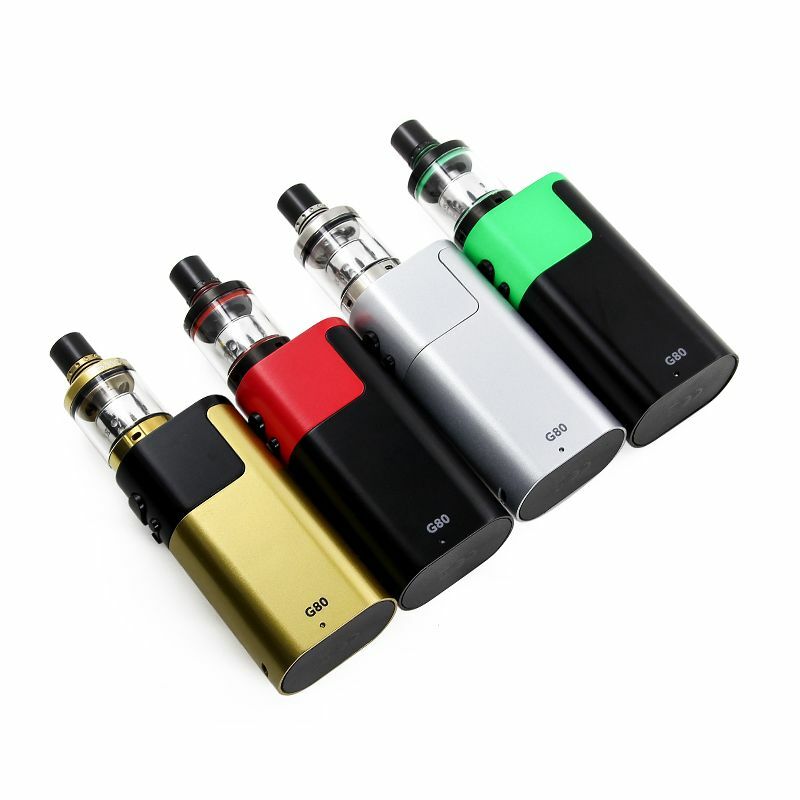 Within this kit you will find the slim single 18650 G80 temperature control device paired with Smok Tech's Spirals Sub-Ohm Flavor tank. Smok Tech's Spiral Sub Ohm Tank is a compact 22mm atomizer with a 2mL tank capacity. This sub ohm tank features a threaded top cap that once removed reveals the innovative top fill channel that allows you to quickly refill in just a moment's notice without allow a drop of liquid to go to waste. Smok includes two of the Spirals Kanthal Dual Core atomizers for variable wattage vaping right out of the box. These atomizers are engineered to maximize flavor quality rather than vapor production, coming equipped eight wicking holes and a organic Japanese cotton wick for the purest flavor possible. This tank also features a 510 threading, a bottom adjustable airflow control ring with four wide air slots, and a strong stainless steel construction that will easily withstand a few falls without showing an ounce of damage. The G80 box mod is a compact single 18650 (sold separately) that features both variable wattage and temperature control output modes. This device features a power output range of 6-80W with a temperature regulation range of 200-600°F. In variable wattage mode the G80 device will support kanthal and stainless atomizers rated anywhere from 0.1-3.0Ω or in TC mode it will accommodate temp sensing element rated within the range of 0.06-3.0Ω. 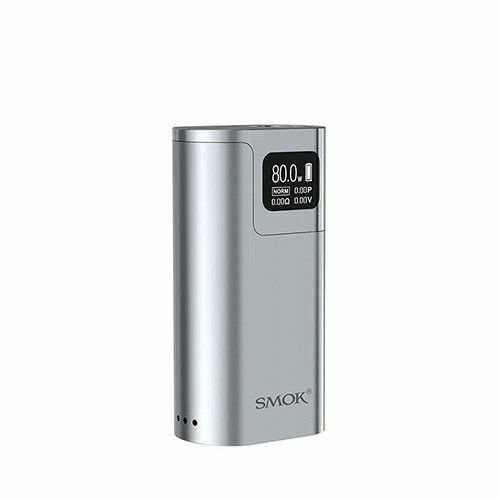 Smok's G80 80W TC Mod also features a convenient slide out battery door cover that allows for quick cell swaps. A micro-usb charging port with pass through function allows you to continue vaping while you charge. Finally/ an OLED screen with detail operating interface provides everything you may need to know in a moments notice including remaining battery life, atomizer resistance, current output/temperature and much more. 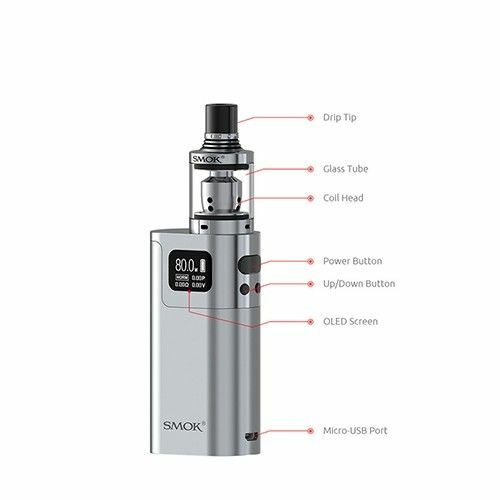 Please note the Smok G80 80W TC Starter Kit requires a single high amp 18650 cell that does not come included with the kit. If you need to purchase this item you can include it with your order by selecting the Add 18650 Battery option above, if you have any questions about this product please contact our customer service line during normal business hours for assistance.